So, I’ve been working on some Runic and Bindrune Charms recently. Seems like the perfect time to talk about making bindrunes – something I’ve been diving head first into. I love them! First things first – What exactly is a bindrune? Well, the answer is, technically speaking, very simple. A bindrune is a symbol that combines two or more runes into one symbol. It might be for magically purposes or for identification (like a maker’s mark – made from the makers initials in runes). How do you make a bindrune? Personally, I make my bindrunes in steps: Intent, Selection, Creation, Finalization. I’ll lead you through the process using one that I’ve created – a bindrune for enhancing intuition. Step 1: Intent – When I sat down to create this bindrune, I wanted something to help people get in touch with their intuition – their ability to dig into the depths and know the unknown. For this, Laguz and Perthro jumped to mind. Step 2: Selection – Laguz is the rune of the subconscious and helps us to take the plunge and go with the flow – and in a culture that tells us trusting our intuition is ‘silly’ or ‘bad’ this is a necessary first step. Perthro, on the other hand, is the rune of the unknown and serves as a direct connection to the limitless potential of the Wyrd. Now is the time to look at the other Runes and see if there is another that belongs in this bindrune. I decided that there wasn’t, so Laguz and Perthro it is. Step 3: Creation – Now, I spend anywhere from 10-30 minutes (depending on complexity) drawing out different combinations until I find the one that seems right. You really have to listen to your intuition during this process. I make as many combinations as I can – keeping an eye out for hiding runes that end up being created (sometimes this works in your favor). I settled on the design below – even though it does have a hiding rune (can you find it?). The final form of my bindrune for enhancing intuition - carved deeply into a tumbled piece of Snow Quartz and painted with silver. Step 4: Finalization – This is where you give the bindrune it’s purpose. 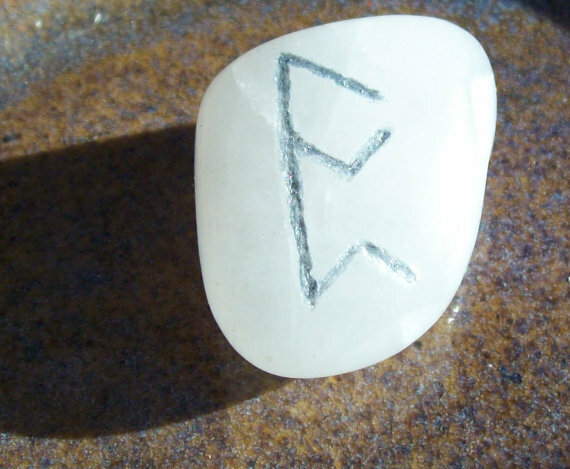 In this example, I decided to carve the bindrune into a stone to create a pocket charm. Whether you are tracing the bindrune on your body, a piece of paper, or into a candle the process is much the same. Trace/draw the rune, then speak it’s intent – I like to use affirmation style, but simply saying “Enhancing Intuition” does the trick. As I mentioned in a previous post I’ve been working with an ancestor, Annawynn, to learn more about the energies and ways to use the Runes. She told me to do a few things; one of which was to go to the lower world and journey to meet the spirits of the Runes. So, last night I did just that. I asked Crow to take me to the spirit of a Rune – whichever Rune I needed to meet. Crow took me to the spirit of Fehu. I spoke with this spirit to learn about the real “nature” of the Rune. Some of what the spirit told me was nothing new but it did expand one key concept: Fehu as the medium of exchange. Not only is Fehu money (our most prominent medium of exchange) but Fehu is the energy field that connects all living thing and allows for energetic transfers. The field is not strong, nor weak – it simply is and always has been. It is the beginning of all forms of exchange – energetic or otherwise. I’m planning on (1) journeying every night for the next few weeks and (2) making a video, perhaps in one shot at the end of each week, expanding on my experiences with the spirits of the Runes. This set is easily one of my favorites I’ve ever made. Picture Jasper is a lovely earthy stone that fosters creative vision and helps the conscious mind understand and work with the unconscious. This is such a tough one to photograph! Rose Quartz is a stone of the heart – it fosters unconditional love and helps one get in touch with their emotions in a gentle way. This time last week I was informed that friend that I’ve gone to school with all my life was in a car accident on his way to work and was in ICU. Saturday morning, I was informed that he was taken off of life support, as per his wishes, so that his organs could be donated. Tomorrow, I will be going to his memorial service. So, what does this have to do with Wunjo? I realized that this man, Alex, was Wunjo personified. To me, Wunjo is joy (of course) and freedom and love between people. Alex was always happy, always smiling, always and forever a joy to be around. He spent a good bit of his childhood with his grandfather, a truck driver, and has been at all lower 48 states. Right after high school he went right to work out in the western part of the state. Alex was also one of the most gentle, caring, and loving people I’ve ever had the pleasure of meeting. His mother simply says he had a heart of gold. Saturday evening someone else got that heart. When I received that news, I cried. Knowing who Alex was, that is exactly the first thing he would have wanted to give. That is truly the beauty of Wunjo – giving love, sharing freedom, and inspiring joy. Requiescat in pace – and may our souls have the pleasure of crossing paths again and again.